A few weeks ago I got together with a first grade teacher at my site. 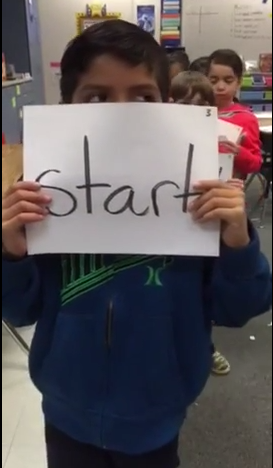 We decided to video tape her students holding high frequency words. The idea was to create a fun way her students could practice their words, at school and home. Needless to say, it has been a big success. The students love it, and the parents love seeing it on our school’s FaceBook Page. So today when I stopped by to see if she needed another taping session, I was sad to find that she was a little down about the project. She had been so excited about this idea and how well it went, that she shared it with others – in hopes that they would find it as inspiring as she had. This is where she became disappointed. Unfortunately, some that she shared this with, immediately disregarded the idea saying that it would never work [for them]. And this is when I realized that those ‘new’ to technology in the classroom can be fragile. Fragile in the sense that this great new ‘thing’ that they are excited about and finding success with, which is then quickly disregarded by others, can easily break one’s spirit. She was truly disappointed that others had not wanted to try this. However, I quickly reminded her that 2 other teachers were inspired by her and had also taped their students. It is stories like this, that encourage me to be the cheerleader for those who are willing to try. It is because of this teacher, who is now thinking of other ways to incorporate tech into her classroom, I will do what I can to support all those who dare to try something new. It’s not easy being the ‘Lone Nut’ [Jon Corippo & CUERockStar reference] in your grade level, on your campus, or in your district. But when a bunch of ‘Lone Nuts’ get together, amazing things begin to happen! And for this reason, I am looking forward to working with her with all the crazy ideas we can dream up! Oh, and did I mention that she is a self proclaimed ‘non-techie’? Yeah, she’s THAT crazy – willing to dive into tech even when it’s outside her comfort zone. Mrs. Bolger, you inspire me! This entry was posted in Random Thoughts and tagged students, support, teachers by Admin. Bookmark the permalink.